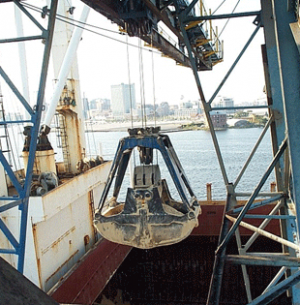 It features Bucket Position Indication, providing the operator with the open/close status of the bucket while dredging (underwater) or the bucket just isn’t visible. This is done via analog output from the closing hoist and is received by an analog meter, or by an MMI. No communication (such as master/slave) is needed. In order to maintain the bucket in the open position while lowering, both hoists must operate at the same speed. In order to keep a full bucket closed while raising it out of the pile, torque must be proportionally shared between the two hoists.